There are several popular shapes a diamond can be cut into. They come in many variations, but perhaps the rarest feature you can choose is the color. Most diamonds are white, but occasionally, you come across a green diamond, usually in a museum. Diamonds can also be pink, brown, or red, which comes from a unique combination of pressure and heat during formation, yellow or orange from the interference of nitrogen, purple from the interference of hydrogen, and blue from the presence of the element Boron. Possibly one of the best ways to showcase style and personality is through the cut of the diamond. It can say you are an elegant, die-hard romantic, or that you are daring and love a good twist. We will look in depth at each cut to decide which best portray you. The diamond shape refers to the appearance of the stone, and the cut to the diamond's ability to reflect light. 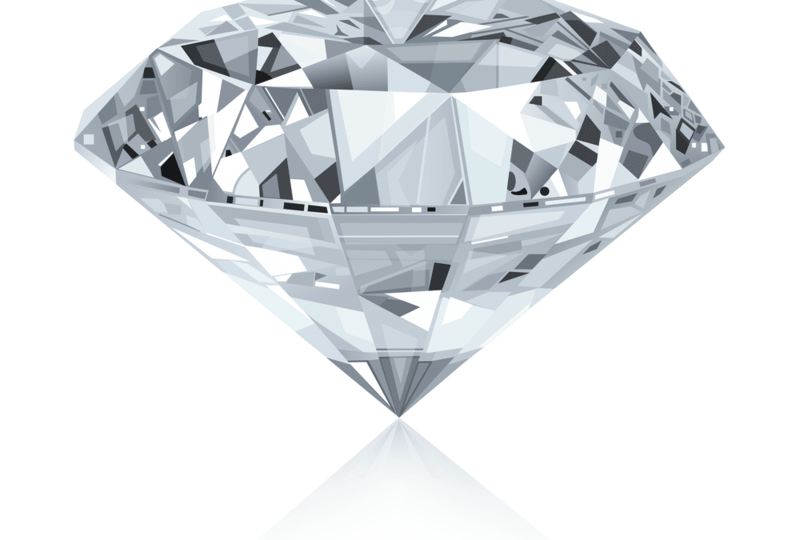 When purchasing a diamond, look for the "Four Cs" determining quality. These are color, cut, carat, and clarity. 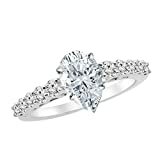 Depending on the lady the diamond is for, she may prefer a tinted diamond over a colorless, or a smaller carat weight. We will look at the characteristics of each cut later in the article. 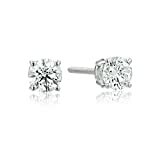 What Are the Quality Ranges for Diamonds? Where Can You Buy a Diamond? 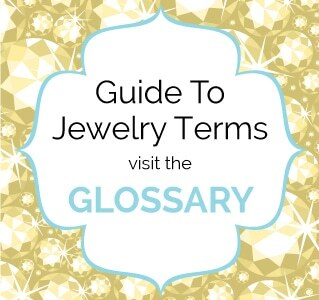 Diamonds can be purchased from almost anywhere, from online websites to fine jewelry stores and local pawn shops. 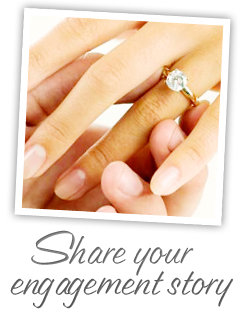 What you are looking for will determine where you should purchase your diamond from. To come up with this list of the 10 most popular diamond shapes, we thoroughly researched and reviewed several popular cuts. We scoured through dozens of customer reviews online and took into consideration the input of experts in the industry. The following products were reviewed based on the parameters of features, pros and cons, price, and where they can be purchased. Diamonds are priced based on several factors, not the least of which is carat weight. There are clear-cut pricing tiers regarding the weight of diamonds. These tiers are 0.50 carats, 1.00 carats, 2.00 carats, and 5.00 carats. The significance is astounding. A diamond weighing 4.90 carats is 15% to 20% less expensive than a diamond of the same cut, clarity, and color weight 5.00 carats. Similarly, a 1.00-carat diamond is 15 to 20% more expensive than a 0.90-carat diamond. Besides weight, a diamond with a higher price tag typically indicates better clarity or color; or a more popular cut. Screw Back posts allow earrings to be securely place irrespective of any activity you have planned for the day. Hand set New York City 4 Prong Setting. The princess cut diamond is a contemporary square design with 49 facets. The clean lines display an intense sparkle that makes people notice. It has been popular in recent years for its blazing sparkle and versatility in a variety of settings. These diamond shapes are perfect for the voguish girl who likes to display her feminine side. 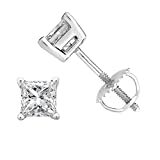 You can purchase a princess cut diamond shapes stud for your earrings for around $. Carat weight listed is the total for both studs. The timeless round cut diamond has been many a woman’s dream. Often, when people think of a diamond, their mind’s eye pictures a round cut. With its 58 facets of exquisite brilliance and the capacity to conform to numerous settings and styles, the round cut is the type of diamond for the elegant lady with a love for the traditional. 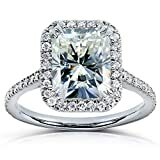 Also known as the “pillow-cut” diamond, cushion cuts are diamond shapes cut into a square shape, but with rounded edges. They are known for their soft, vintage look that can fit a variety of settings, like the cuts mentioned above. It is perfect for women who want a classic feel with a contemporary twist. This product can be found on Amazon for around $$$$ to $$$$. 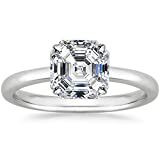 Anyone looking for truly unique diamond shapes should consider an emerald cut. It is a step-cut rectangle with long facets that give off striking bursts of light. It is categorized as a refined diamond with an Old World allure. With this type of cut, you can see right through the stone, like gazing into the bottom of a still pool. This diamond is for those who appreciate the vintage style, and who prefer luster over sparkle. This product can be found on Amazon for around $$$$. Features the beauty of the oval cut is that possesses all the standards of a round cut, but with a unique spin. The longer shape seems larger than a round cut, while remaining easily paired in various surroundings. This is for the woman who is classy and understated but still wants a statement. The marquise cut, said to be named after the smile of Marquise de Pompadour, enhances the carat weight with its elongated shape. It has gained popularity among celebrities and is known for giving a dainty and slender appearance to a woman’s hands. This cut is guaranteed to impress the lady who is not afraid to make a statement while maintaining a feminine essence. You can purchase this product on Amazon for around $$$$. The pointed tips can be fragile and easily damaged. The adorable pear cut was created with ideas of a round cut in mind, to give off the largest amount of brilliance possible. This diamond is a marriage of a round cut and a marquise cut, with a delicate teardrop shape that looks best in a halo setting. Some of the world’s largest and most famous diamonds have been shaped into a pear, such as the Star of Africa and the Millennium Star. A woman who exudes originality with a sweet, dainty side will love a diamond with this cut. This product can be found on Amazon for around $$$ to $$$$ depending on the metal and color of the band. 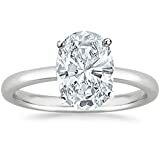 You can purchase a 0.50-carat weight, the pear cut white diamond on Amazon with a pronged setting for a reasonable price. While the standard range found online is $$$ - $$$$. Center Stone is a 0.5 Carat D-E Color SI1 Clarity Center Stone. For a dramatic diamond with a modern take on the emerald cut, the Asscher cut rises to the top with a visible X pattern in the step cut. At first, this shape had 58 facets, but it has been updated to 74 facets for an extra punch of sparkle. 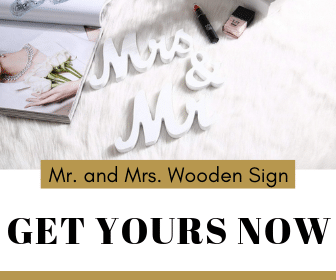 It has become incredibly popular with celebrities and would make an awe-inspiring ring for anyone wanting to keep up with the trends while keeping a vintage feel. This product can be found on Amazon for around $$$ - $$$. The Radiant is a combination of two diamond shapes. 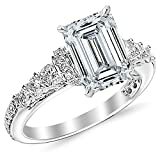 An emerald cut and a round cut are combined to create a separate look in a radiant cut diamond. The hard edges of a rectangle are rounded off, and the best brilliance comes from a diamond with a deeper base. Giving off a complex and exciting vibe, the radiant cut accentuates the woman with a fearless attitude and a meaningful glow. This product can be found on Amazon for around $$$ - $$$$. Clara Pucci's 7.0mm AAAAA excellent cut heart-shaped cubic zirconia, 1.30 CT. Solid 14k white gold designer ring. Last but not least, the cut for the person who lives for romance: the heart. 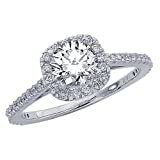 This beautiful shape is best displayed in a solitaire setting where its lines can be easily shown off. 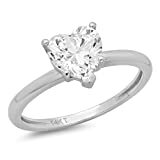 The woman who knows exactly what she wants and loves the sentimentality of the perfect symbol of love will thrive with this cut. 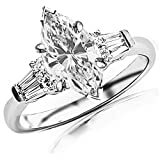 Because of the vast selection of diamond shapes, choosing the best one really comes down to what you are looking for and who you are buying for. Do you want to make an impact, or would you rather go with tradition? Are you looking for brilliance and sparkle, or luster and shine? Are you more concerned with the quality of the diamond, the color, or the size? The combinations are endless when choosing your diamond shapes. Use the advice and information given, consult your budget, and go with your gut.